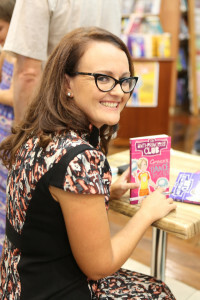 Samantha Turnbull is the writer of the children’s podcast Fierce Girls (ABC, 2018), and the children’s book series The Anti-Princess Club (Allen & Unwin, 2015). She specialises in stories that feature strong girls (but that doesn’t mean that boys can’t read them). No princesses. No damsels in distress. No fairies. Sam is also a slam poet, and you can see one of her first-ever performances here. Sam’s ‘day job’ is as a multimedia journalist with the Australian Broadcasting Corporation. I was born in Lismore in northern NSW, but moved away when I was a baby. I lived all over the state in towns including Scotts Head, Macksville, Bathurst, Merriwa, Scone and Alstonville. I went to uni in Canberra and eventually settled in my favourite place in the world – Byron Bay. * What is your favourite book? From my childhood: Matilda by Roald Dahl, Tuck Everlasting by Natalie Babbit, and everything by Robin Klein and Judy Blume. * Why did you want to become a writer? I love imagining new places and people. I like expressing my opinion. And writing just makes me happy. * How do you become an author? Read a lot. Write a lot. Stay true to yourself. Don’t give up. * Did you like princesses when you were a kid? Yes. But I wasn’t obsessed with them. And I didn’t own any princess ‘stuff,’ other than the odd book. And I liked lots of other things more than I liked princesses. * Who is your favourite princess? * If you weren’t a writer what would you be?